Mandy Ploetner is a recent graduate of University of Indianapolis. She acquired a Bachelor’s of Exercise Science degree from IUPUI in 2014 and pursued further education at University of Indianapolis in the PTA program in which she graduated August of 2017. She is originally from Jasper, IN and is now living in Indianapolis with her husband, Eric who is also from Jasper. Mandy and Eric met in high school and were recently married in June of 2017. Eric graduated from Purdue University in May 2014 with a degree in Civil Engineering where he then moved to Indianapolis to pursue his career at GPD Group as a Structural Engineer. As of now, they reside on the northeast of Indianapolis but are trying to find some land to build on in a few years so Mandy can be closer to work. Mandy’s current hobbies include playing sports such as: golf, softball, basketball, and beach volleyball. She particularly loves to be outside as much as possible and enjoys running and being active. She also enjoys watching golf, as well as, college basketball and is an avid Purdue fan. She currently has two dogs (and would have more if her husband would let her!) and enjoys spending time with them. She was a PT technician at another physical therapy clinic for several years throughout her schooling where her love of physical therapy blossomed. She loves the atmosphere of a smaller physical therapy clinic where the emphasis is on the patient versus that of a larger corporation. Many relationships have been formed through her years as a tech and she looks forward to forming the same relationships at Hayden Physical Therapy. 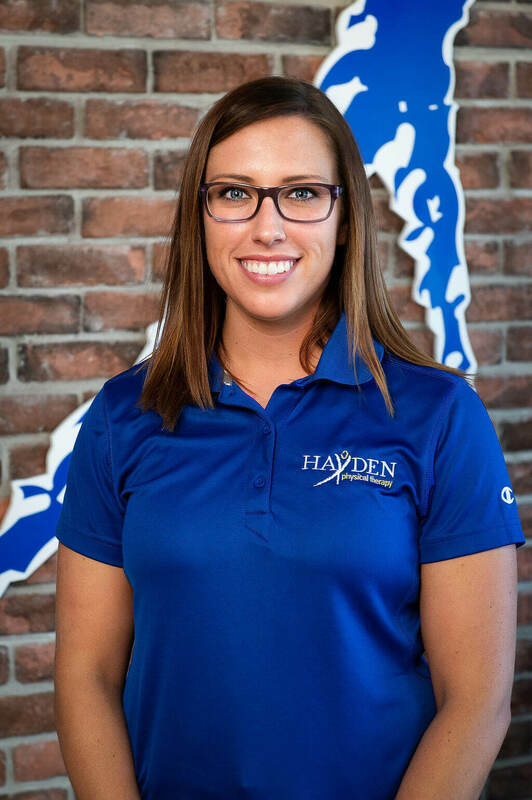 She looks forward to a bright future with the team at Hayden Physical Therapy!